That didn't take long. 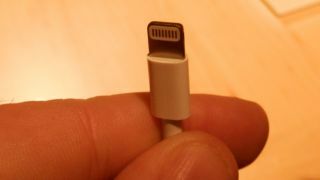 The first Chinese company has reportedly cloned the iPhone 5's Lightning cable, despite the fact that Apple embedded a tricky authentication chip. It took iPhone5Mod.com less than a month after the phone's Sept. 12 announcement to come up with a working, chip-included cable option. Of course, while this knock-off Lightning cable is available to order right now, it still comes from halfway around the world. So it'll take somewhere between seven to 20 days for delivery. The Lightning Cable from iPhone5Mod.com costs $19.90, meaning it really isn't any cheaper than Apple's official Lightning to USB cable. However, it's a good sign for frugal consumers. Because the chip was replicated rather quickly, it shouldn't be long before the internet is flooded with similar 8-pin Lightning accessories. It also opens the door for more interesting cables designs and docks. The retailer's website says that its version of the Lightning cable is illuminated. "You can actually see the flow of current going into your iPhone 5," reads the iPhone5Mod.com website. The website is selling a dock that allows the iPhone 5 to sit upright while syncing and charging. This accessory, also $19.90, is something Apple doesn't sell at any price.